With well over 200 requests to read (more than we had this same time last year) we're just about ready to send out our acceptances/regrets. We thank everyone who expressed an interest in reading this year--and we hope you all will come out this summer! --Sponsor notices went out. Full Sponsorship is $150--Program Patron is $25. If you are interested, let me know. 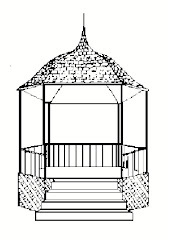 --We're now on Twitter @SummerGazebo. We'll post updates, cancellation info, etc as the year progresses. --We will have a modified open read (MOR) schedule. You can sign up, in person, at a reading to read one poem at a future date. Each week we will have 2 or 3 poets read in between the four regularly scheduled author/poets. It will expose our audience to more talented people than we can fit into the regular schedule, and it will give a bunch of poets an opportunity. (Scheduled readers are ineligible for the MOR). Become a Sponsor or Program Patron!